As posted on the Forecast Front website, February 28, 2011. CHENNAI: In February, “Sleeping Children Around the World” (SCAW) travelling team had the privilege of working with The Rotary Club of Ambattur in Chennai, India. SCAW is a Canadian charity, founded by Murray and Margaret Dryden, which gives bedkits to needy children in underdeveloped and developing countries. They believed that every child should have the benefits of a good night’s sleep. Only then would they be able to function well in school and in their daily lives. 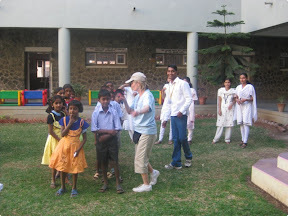 This was first accomplished in Poona, India in 1970 with the distribution of 50 bedkits. Bedding, clothing, school uniform, school supplies, a school bag and a mosquito net make up the contents of the bedkit. The SCAW team distributes the bedkits and takes a photograph of each child to send back to the donor. SCAW is operated by volunteers from the processing of the donation to the distribution of the bedkits. One hundred per cent of every bedkit donation reaches a needy child. Each bedkit is valued at $35 CAN. The Rotary Club of Ambattur and SCAW celebrated 25 yrs of working together in February 2011. In that period of time nearly 80,000 bedkits were given to impoverished children in and around Chennai. This year Chennai received money to finance 6000 bedkits for distribution by the Rotary Club. The purchasing of the bedkit items and the venues of the distribution are looked after by the Rotary Club SCAW committee. They are responsible for selecting and identifying the children from economically challenged families, who range in age from 6 – 12 yrs old. Food and transportation for the children are also provided by the Rotarians on the distribution day. Sleeping Children Around the World, the Rotary Club of Ambattur and most of all the donors continue to fulfill the mission of “giving a child a good night’s sleep” to the less fortunate children of Chennai. As published in the Barrie Advance & Innisfil Journal, February 28. 2011. Just some further information on Donald Potter’s letter about Sleeping Children around the World (SCAW) – this very worthwhile charity was established by Murray Dryden, a 40-year member of Kiwanis. Mr. Dryden, in his wisdom, established criteria whereby all donations went to fund bed kits. The preparation and distribution of the bed kits is handled by volunteer organizations rather than government agencies. Hence, many different service clubs and volunteer organizations around the world have contributed their time and money in meeting the needs of over one million children. In 2010, Dave Dryden, who now heads SCAW, accepted the Kiwanis World Service medal at the Kiwanis International Convention in Las Vegas. He explained that all donated money goes to purchase and distribute bed kits. This is possible because his father established a foundation (Pinehurst Club) to pay all administration costs of running the charity. This foundation is also volunteer run. I salute Mr. Potter and all the other Canadian volunteers who have paid their own expenses to go off to areas in the world such as Indonesia, the Philippines, Bangladesh and Zimbabwe to name a few. These are people who are really making a difference in the world. I encourage everybody to visit the website at www.scaw.org and consider purchasing a bed kit. As posted on the Trib Local, Downers Grove, IL, February 27, 2011. SEASPAR Aktion Club member Bridget Brown, of Darien, ( Pictured at right with her award.) won first place in the International Aktion Club Speech Contest. 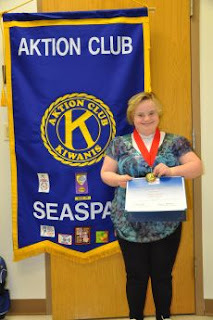 The Aktion Club is a unique community service club for adults living with disabilities, formed through a joint sponsorship of the Downers Grove and Lombard Kiwanis Clubs and SEASPAR. The Aktion Club has more than 200 clubs in seven nations. The theme of this year’s speech contest was “How Are You a Hero in Your Community.” To reach the international level of the competition, Bridget had to place first in the Illinois-Eastern Iowa District. SEASPAR Executive Director, Susan Friend, stated that “Bridget is a talented young lady and delivered an exceptional speech. She is a speaker and advocate for people with disabilities. The club is very proud of her accomplishments.” Six other members competed in the speech contest. Over the past four years Aktion Club members have won first place three times in the International Speech Competition, and also received a second place. The Aktion Club also won first place in the Annual Scrapbook competition in the Illinois-Eastern Iowa District. The group compiled a scrapbook highlighting activities in their year, with sections about community service, SEASPAR (their sponsoring agency), and published media about their club. Another program taken on by the Aktion Club was their sponsorship of the Winter Wonderland Dance, with the purpose of raising funds for community charities that the club selected. Recipients of the funds included Operation Support Our Troops Illinois, local food pantries, Senior Home Sharing, and PADS. The group will be presenting checks to these organizations in the near future. Seventy-five people attended the dance, and $1,200 was raised. The dance was held at the Clarendon Hills Park District. Other service contributions by the club in the past few months include the sponsorship of a Downers Grove Township family at Thanksgiving, adopting a Downers Grove family at Christmas, purchasing books through Anderson’s Book Shop Book Angels program, and the purchase of three bed kits for Sleeping Children Around the World (an International Aktion Club Project). They are also supporting Samaritan’s Purse with donations. Those interested in learning more about the club should contact Susan Friend at SEASPAR, 630-960-7600. As posted on Chicsavvy, A Backpacker's Guide for Grown-ups. Our two days of touring are officially over. We took a flight from Mumbai to Hubli and then drove to Belgaum, our home base for the next five days as we drive in and out of some of the most rural parts of India. The first thing we did when we arrived was visit some of the homes that received a bedkit from past distributions. We did this for a number of reasons. Not only is it good to make sure the bedkits are getting into the hands of families/children that need them most, but we also want to make sure they are using them appropriately and they are equipped with what the child needs most – mosquito nets, clothing, mat/bedding/pillow, school supplies, kitchenware, shoes, backpack and a towel. I’ve been to very poor communities throughout the world so I prepared myself in advance for what I was about to see. But no matter how much you prepare yourself, it doesn’t seem to matter. The families live in the tiniest of houses – if you can even call them houses. A typical home is about 10X10 ft broken up into a kitchen and a sleeping quarter. One of the homes we visited slept 15 people in one room, which is common. Luckily the families we visited had running water nearby. Of course there was no electricity and families cooked out of fire pits in or just outside of their homes. The families had no real possessions and food was something they never could rely on having. One great thing about the children SCAW reaches is they all go to school, so the contents of the bedkit help that child get a good night’s rest so they can be ready for school the next day – the motto SCAW prides itself on. The following day was our first distribution day. 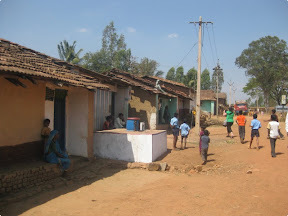 We visited two communities – Athani and Nepani. Both were located approximately two-three hours outside of Belgaum. Driving to each distribution reminded me of driving through parts of Africa – very rural, lots of crops growing, huts at the side of the road, workers building small cemented homes, people pushing cattle up the road, and lots of small store fronts representing pocketed communities. Obviously there is much more that takes place in between, including all the fun interaction we have with the children (the BEST part), but this gives you an idea of what’s involved and how organized everyone has to be to get the job done, and done right. We gave out 450 bedkits out of the 4,000 total bedkits we are delivering on this trip. This was my first time participating in a bedkit distribution. I had a feeling of what to expect based on what I heard from other traveling volunteers as well as from what I knew about the charity, but nothing prepared me for witnessing it firsthand. From the curiosity and smiles of the children receiving the bedkit and their parents, to the team work between SCAW, the local rotary clubs and volunteers, and to the support from the donors back home in North America, it was really a 360 degree moment for all. 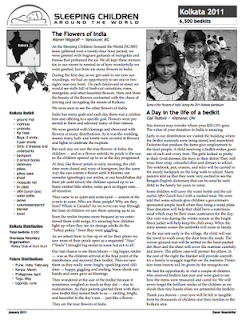 The donor newsletter for the Kolkata 2011 bedkit distribution has gone to print and can be downloaded from the Sleeping Children Website. Photos are available in the Kolkata 2011 Photo Album. You can view them by clicking the link above. Submitted by Eileen Rademacher, February 22, 2011. I’ve been to many countries around the world, but nothing could prepare me for the contrast I was about to see in Mumbai. I say contrast because of two extremes — the tall, modern skyscrapers, BMWs and businessmen roaming the streets, to extremely poor people hanging out by the railroad tracks, begging for money, performing any job they can and eating whatever they can find. 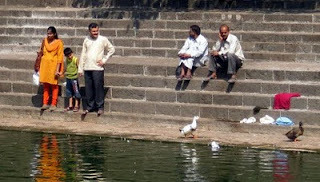 Sure, there is definitely a middle-class, a very large one in fact, but given Mumbai’s large population, it was a lot easier to see the clear division of social classes. Amin grew up in the slums of Mumbai. He left home when he was young, after being beaten several times by his stepfather. He then lived a tortured life on the streets, falling victim to prostitution, hunger and abandonment. 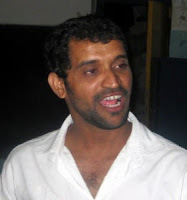 One day, he was approached by a nun and brought to a nearby orphanage called Snehasadan where he turned into the most optimistic and kindest 30-year-old man I’ve ever met. He now lives with his mother, sister and 13-year-old niece, and prides himself on his car — for without it, he wouldn’t be able to take people like me on tours of his city, which he is so proud of and humbled by. And let me say, he was the best tour guide ever! In less than six hours, we did more than I could have imagined. First, we visited the home Gandhi grew up in. It has since turned into a museum (no admission fee required), and the third floor is home to a room filled with small puppet displays depicting Gandhi’s life and historical moments in time related to freedom and liberation. Coincidentally, one of Mumbai’s annual art festivals, Kala Ghoda, was in town and we spent some time browsing local artists’ work. It was a great way to see some of Mumbai’s cosmopolitan flare, straight from the artists themselves. Amin also took us on a walking tour of the slums. We started off at the Banganga Tank (Pictured at right.) — filthy, but considered holy water where people go to worship the dead — and finished off at Dhobi Ghats, an open air laundry facility where people hand-wash hundreds of pieces of clothing and linens each day. In addition to making a quick stop to see the Taj Hotel and Gateway of India, we capped the day off with a delicious late lunch at the bustling Leopold’s — a bit of a tourist attraction, but the food was pretty tasty. We couldn’t have asked for a better day! Also check out Tamara's previous blog post on Chic Savvy. As posted on Inside Toronto, February 11, 2011. This exhibit features images taken in late summer in Paris, the Loire Valley and Claude Monet's Giverny. Explore new places through Jones' photographs. The exhibit is on display until Feb. 26, on Monday to Saturday between 7 a.m. and 7 p.m. and Sunday 10 a.m. to 5 p.m. Treat yourself to a hot beverage at the Coffee Tree, 2412 Bloor St. W. (just east of Jane Street) while taking in the exhibit. Ten per cent of sales from this exhibit will be donated to the non-profit organization Sleeping Children Around the World. As posted on the Chic Savvy Blog, February 10, 2011. In just a couple short days, I’ll be embarking on another travel adventure. See, whenever I plan a big trip, I always want to make sure it has some kind of purpose — not necessarily because I want to get the most value out of the money I spend, but rather because life’s just too short. It’s important to sprinkle it with meaningful adventures, whether that’s taking yourself out of your comfort zone, experiencing something breathtaking, learning about other cultures or the way other people live in this world, or giving back to society. 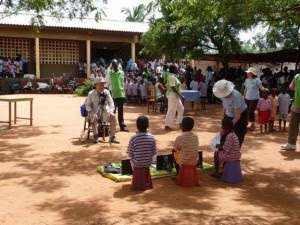 Bedkit distribution in Togo with SCAW. So what did I decide to do this time? I’m traveling to the rural parts of southwest India with six complete strangers to give 4,000 children in need a better night’s rest as part of a volunteer bedkit distribution trip with a Canadian charity called Sleeping Children Around the World (SCAW). I work for a PR agency called Maverick PR. Four years ago, our president (Julie Rusciolelli) told us about a charity we were going to offer pro bono services to. She told us it was founded by the Dryden family (the parents of NHL legends Ken and Dave Dryden) and that it raised money and distributed bedkits (typically consisting of a mosquito net, mattress, school supplies and clothing) to children in need in underdeveloped and developing countries. That was all I really needed to know before I knew I wanted to help out in any way I could. I knew I would one day go on a distribution trip with the charity; however, different variables always got in the way, whether it was timing, money or just plain life. A team of seven volunteers (yes, we’re paying our own way — SCAW is a 100 per cent charity so every cent of a donation goes directly to a bedkit/child in need) are traveling to Belgaum, India to distribute 4,000 bedkits. A donation of $35 to the charity pays for one bedkit. SCAW then works with third-party rotary clubs in the designated country to organize and assemble the bedkits and source children in need to receive them. A traveling team of volunteers (us) then travel to that designated country, hand out the bedkits and ensure a smooth transaction — we even take pictures of each child receiving their bedkit and send them to the donor upon our return. To date, the charity has raised more than $23 million to provide bedkits for children in 33 countries. Here is something that was recently sent in the name of my child to aid a child in another part of the world. When I opened this I was truly touched and inspired as this gift resonated the power art has to change a persons life. 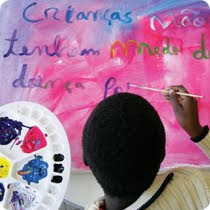 It is called "Art in a Box" and is part of the UNICEF campaign called "Gifts of Magic." UNICEF, the United Nations Children’s Fund, was created in 1943 to temporarily help children in European countries devastated by World War II. In 1953 it was permanently instated to help children around the world gain access to necessities they might not otherwise have. It is the largest and most recognized charity of its kind helping children with education, access to basic necessities, health needs as well as protection. Here in Canada you might recognize the name from their annual Halloween drive. A drive in which children at Halloween carry a donation box from door to door to help raise funds while trick or treating. This fund helped raised millions of dollars to help immunize and provide health care to children in needs. As times change so have fund raising drives and with the power of the internet it allows individuals to donate easily directly to recognisable and responsible charities . One of these ways is Unicef’s “Gifts of Magic” campaign . Through this program you can easily help a child or community by donating via the internet. You can choose the gift you wish to share as well as how you wish to recognised for your gifit, if at all(they will send a card in the mail with your name on it to the person of your choosing. You can give the gift of water, education, gifts for marriage or even transportation. Donations can start for as little as 10.00$ (that is one beer at bar, a pack of smokes or one taxi cab ride on a night out). Do someone a favour and give the gift of hope, every child deserves a future. If supporting Unicef isn’t your thing here is a list of other recognised charities where your money makes a difference. BARRIE I can certainly sympathize with Maria Bentley (Where did the money go?, Jan. 25) as I have been involved in volunteering and giving to charities over the past 15 years. What I found, not to mention any of these charities, was that only a portion of the monies I donated went to the specific cause the particular charities were supporting. I looked into this and found a person can receive from the federal government a list of those charities with their cost of operations. I was amazed in most cases how little went to the people or countries they were supporting, and also that these organizations were receiving grants from our government – this being taxpayers’ money. A good friend of mine told me about a charity, Sleeping Children Around the World, started by Murray Dryden in 1970 to provide bed kits for children in 34 countries. Mr. Dryden and his wife were in Calcutta, and were going out to dinner one evening when Mr. Dryden tripped over something in the street. It was a small child sleeping. He was so taken aback that he talked to his local Rotary Club, which put him in touch with Rotary International. Since then more than one million bed kits have been distributed. I became a volunteer and over the past seven years, I know that 100 per cent of the monies went directly to those needy children. You can find out more at www.scaw.org. Dress Down Day Thursday, February 17th. Bring in $1.00 to help Sleeping Children Around the World. For many children around the world, a safe, restful and comfortable night’s sleep is not possible. Hunger, poverty, and crowded living conditions deprive them of this most basic human need. $35.00 provides a bedkit for one child, which contains a mat, sleeping bag, pillow, mosquito netting, pajamas, sandals, and toiletries. Every penny you donate goes to the children. Our Grade 6 Helping Others Club is organizing and managing this fundraiser. As posted on the Beacon Herald website, February 6, 2011. If it's true that there's no education like adversity, then the congregation at Knox Presbyterian Church is learning fast. It has certainly been tested in the last year or so -- with financial challenges, a failed amalgamation with St. Andrew's and the departure of its minister. But the church is moving forward with a renewed sense of focus, said Sue Orr, a Knox board member. "Any church, if it goes through a hardship, comes out stronger," she said. "We are stronger now. We know who we are and what we want to be." In an interview at the historic downtown building Friday, with light streaming through its majestic stained glass windows, Orr was reluctant to dwell on amalgamation, a sensitive issue for many in both congregations, even more than a year later. But she didn't sugar-coat it either. "Amalgamation is still a bitter word for a lot of people," she said of the scuttled plan to bring the two local Presbyterian churches together as a cost-saving measure. A "handful" of members left Knox in the wake of the decision not to join with St. Andrew's. But for Knox, the decision to keep the iconic church at the corner of Ontario and Waterloo streets as its place of worship was the right one, said Orr. "The congregation is very passionate about this building," she said during a tour of the landmark structure, which dates back nearly 100 years. "We like to be the downtown church. We like to be a church that is connected to the community in a very strong way." And virtually every single room inside it speaks to that connection, said Orr. The sanctuary is the place not only for the regular Sunday worship service, now led by guest minister Rev. Dr. Brian Lapier, but also a number of community concerts. There's the Alley Thrift Store that supports church missions both locally and internationally. A banquet hall and adjacent kitchen host regular community meals, concerts, wedding receptions and other functions, and there's space for local support and youth groups such as Choices for Change-Crossing Bridges, Youth for Christ and Girl Guides. There's even a parlour where local cancer patients undergoing chemotherapy or radiation treatment can get fitted for a wig or head covering. "The building is a tool to be there for the community," said Orr, who is leaving next week to travel to India for another mission the church supports -Sleeping Children Around the World. But the building has costs associated with it. When the amalgamation plan was cancelled, the Huron-Perth Presbytery, the governing body for Knox and St. Andrew's, encouraged each to balance their budgets and work at reducing their debt. Knox is "well on its way" to meeting or exceeding those financial goals, said Orr. "We're definitely on track," she said, pointing out that, above and beyond its financial commitments, an additional $30,000 was raised by some members of the congregation last year to help pay for new wheelchair-accessible washrooms and a new nursery in the church. It's just part of an overall investment in something worth preserving, said Orr. "Yes, it's a big building, and a bit of a burden, but it's also a tool that makes things happen," she said. Watch for the second part of this series, focusing on St. Andrew's Presbyterian Church. For 11 years Lynx Systems Inc. has been committed to the philosophy of working together as a team to make a difference. Like last year, the Lynx team supported the excellent work of Sleeping Children Around the World. 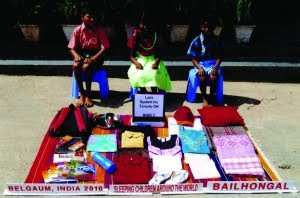 Sleeping Children around the world (SCAW) donations provide bedkits to children of any race and/or religion who will benefit the most; typically being located in underdeveloped and developing countries. 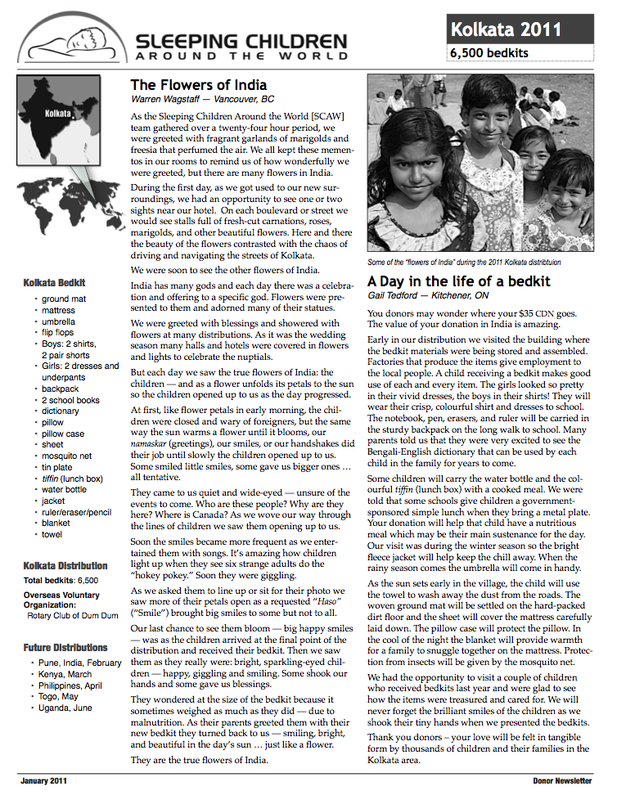 No portion of a bedkit donation is spent on administration – 100% reaches a needy child. Each 35$ donation (Canadian Funds) provides a bedkit that consists of a mat or mattress, pillow, sheet, blanket, mosquito net ( if applicable), clothes outfit, towel and school supplies. This year Lynx Systems donated 20 BedKits to Sleeping Children Around the World.